Failure to do so may result in the deposit being rejected. Deposit your checks anytime, anywhere with AnytimeDeposit! AnytimeDeposit is easier and more convenient than making a trip to a branch, and frees you up to manage your busy life. AnytimeDeposit is secure, easy to use and convenient. Deposit eligible checks directly into your account using your Android or Apple mobile device. Take photos of the front and back of your check and submit. It’s that easy. Get confirmation on your phone for each successful deposit. You can save time and money with fewer trips to an ATM or branch. AnytimeDeposit is available as a button within FMFCU’s Mobile Banking app available in the iTunes App Store and Google Play for Android. AnytimeDeposit only available for Android or Apple devices. It’s simple (and FREE!) to send money to anyone, anywhere! Make transfers from your FMFCU accounts easily. Once you set up your account from your mobile device, you can send funds from your smartphone or tablet. 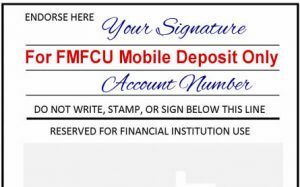 Using your recipient’s mobile phone number, e-mail address or account number, send money directly to their bank account – even if they aren’t an FMFCU member. Save contacts using their mobile phone number or e-mail. You can also use their account information. For e-mail delivery, the recipient will receive directions on how to pick up the money you sent. Waiting for your friend or co-worker to pay you back for lunch? It’s easy for other Mobile Banking users to send you payments – just make sure they have your mobile phone number, or e-mail address. Safety is our top priority and we are committed to protecting the security of your account information. Read more about our under Internet Use and Mobile Devices. Person-to-Person Payments (RealPay®) are available for most personal checking and money market accounts. External transfer services are available for most personal checking, money market and savings accounts. To use either of these services, you must have an Online Banking account with a U.S. address, a unique U.S. phone number, an active unique e-mail address, and a Social Security Number. Your eligible personal deposit account must be active and enabled for ACH transactions and Online Banking transfers.